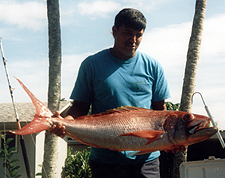 Patrick Henriques was bottom fishing off Nawiliwili, Kaua'i when the state record lehi inhaled his calamari bait. Patrick raised the fish using an Elec-Tra-Mate reel and 80-lb test line from 74 fathoms of water. The fish weighed an impressive 32 lbs 7 oz.